In the Chicago suburb of Skokie, one out of every six Jewish citizens in the late 1970s was a survivor—or was directly related to a survivor—of the Holocaust. These victims of terror had resettled in America expecting to lead peaceful lives free from persecution. But their safe haven was shattered when a neo-Nazi group announced its intention to parade there in 1977. Philippa Strum's dramatic retelling of the events in Skokie (and in the courts) shows why the case ignited such enormous controversy and challenged our understanding of and commitment to First Amendment values. The debate was clear-cut: American Nazis claimed the right of free speech while their Jewish "targets" claimed the right to live without intimidation. The town, arguing that the march would assault the sensibilities of its citizens and spark violence, managed to win a court injunction against the marchers. In response, the American Civil Liberties Union took the case and successfully defended the Nazis' right to free speech. 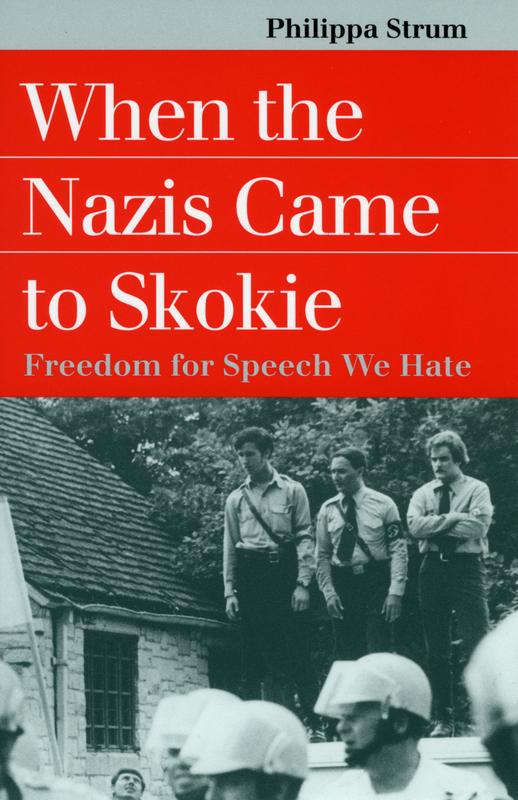 Skokie had all the elements of a difficult case: a clash of absolutes, prior restraint of speech, and heated public sentiment. In recreating it, Strum presents a detailed account and analysis of the legal proceedings as well as finely delineated portraits of the protagonists: Frank Collin, National Socialist Party of America leader and the son of a Jewish Holocaust survivor; Skokie community leader Sol Goldstein, a Holocaust survivor who planned a counterdemonstration against the Nazis; Skokie mayor Albert Smith, who wanted only to protect his townspeople; and ACLU attorney David Goldberger, caught in the ironic position of being a Jew defending the rights of Nazis against fellow Jews. While the ACLU did win the case, it was a costly victory-30,000 of its members left the organization. And in the end, ironically, the Nazis never did march in Skokie. Forcefully argued, Strum's book shows that freedom of speech must be defended even when the beneficiaries of that defense are far from admirable individuals. It raises both constitutional and moral issues critical to our understanding of free speech and carries important lessons for current controversies over hate speech on college campuses, inviting readers to think more carefully about what the First Amendment really means. Philippa Strum, professor of political science at the City University of New York-Brooklyn College and The Graduate Center, is author of numerous books, including Brandeis: Beyond Progressivism, Louis D. Brandeis: Justice for the People,The Supreme Court and "Political Questions", and Presidential Power and American Democracy.